Royal Caribbean is currently running an offer for 30% off the standard cruise fare for all guests in a stateroom. The offer period is February 16 – March 16, 2016 and is good for cruises departing on or after March 16, 2016. Royal Caribbean’s recently renovated Liberty of the Seas departs from Galveston weekly on 7-night cruises with ports of call in Falmouth, Jamaica, George Town, Grand Cayman; and Cozumel, Mexico. 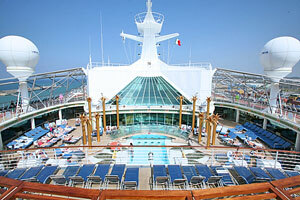 See prices and book a Liberty of the Seas cruise at CruiseDirect. Offer Terms: Savings is automatically reflected in the price of the cruise. Cruise must be booked Feb. 16-Apr. 3, 2016 (the “Offer Period”). Offer applies to sailings departing on or after Mar. 16, 2016. Offer includes 30% off the standard cruise fare for all guests in a stateroom; all stateroom categories. Savings will be applied automatically at time of booking. All other charges, including, but not limited to, taxes, fees and port expenses, are additional and apply to all guests. Offer is combinable with Crown & Anchor discounts, NextCruise offers, and Shareholders benefits. Any dollar off discounts or promotions, such as Crown & Anchor discounts, are applied first, followed by Offer, which is applied to final balance. Offer is not combinable with restricted rates (for example, Seniors, Residents, Military) or any other offer or promotion, including, but not limited to, Standard Group, Interline, Travel Agent, Travel Agent Friends and Family, weekly Sales Events, Net Rates. After the Offer Period, the Offer will be removed from the booking if the guest cancels and reinstates the booking, applies a fare change, or changes the ship or sail date of the booking; certain other changes to the booking may also result in removal of the Offer. Offer excludes all China departures. Offer applies to new, individual and named group bookings confirmed at prevailing rates. Individual reservations can be transferred into an existing group, assuming required criteria are met. Offer available to residents of the United States and Canada. Prices and Offer are subject to availability and change without notice, capacity controlled, and may be withdrawn at any time.